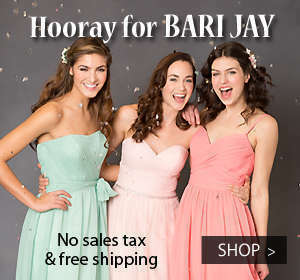 Your once-in-a-lifetime wedding doesn’t have to be your bridesmaids’ once-in-a-lifetime bridesmaid dress! Wear-again bridesmaid dresses truly exist and we found the style tips to get this look! The easiest style to wear after the wedding aisle is the cocktail length dress. Other lengths such as floor length or tea length often translate as formal…or simply scream “bridesmaid”. Cocktail length though is a popular everyday hemline for all women. Keeps hems consistent. Cocktail length bridesmaid dresses look best when all bridesmaids hem their dresses to the same length, either at or just above the knee. Then to really make it their own, bridesmaids can hem the dress afterwards as high as they want to go! Sheath silhouettes win at versatility. 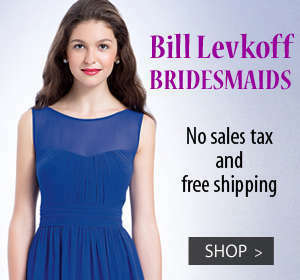 A well-altered slim bridesmaid dress flatters the body shape and transitions flawlessly from the big day. Party Perfect? Add sparkle with statement jewelry and stilettos. Work Appropriate? Layer a sweater cardigan and step into pumps. Date Night Ready? Keep it casual with a denim jacket and pretty flats. The traditional idea to achieve wear-again status was to keep bridesmaids in neutral colors like Black, Mocha, Navy…yawn. While neutrals can be stunning, the new take is to mix it up! Many dresses offer the option to choose a different color for the bodice and skirt. We especially love a neutral top with a pop of color for the skirt. An Ivory top with a Sapphire Blue skirt is on cue for a summer nautical feel! Fashion changes as quickly as bridal gowns in a dressing room so picking a hot new trend can be especially tricky for a bridesmaid dress. However if you stick to a sleek, not-so-crazy design, we say “get trending”! Borrow from trends off the runway or from your favorite store and find bridesmaid gowns that fit the look. Cut-outs are popular this season, and a super wearable look that will last is the cut-out back. A bridesmaid dress your party will love to wear…and wear-again is possible! Shop House of Brides’ designer bridesmaid collections like our newest collection, Colour by Kenneth Winston and feel the love!